Start: Brentford Lock on the Grand Union Canal (GRef TQ173773 ) - we were staying at the Holiday Inn (Lin was attending a course, so I walked on my own). 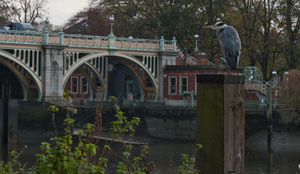 There is a nearby car park, plenty of buses and the walk could equally be started from Kew or Richmond Bridges. 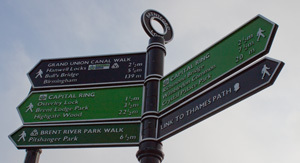 Route: The route follows the Thames path, so is fairly level, though there are a number of places where steps shorten the route. On the southern bank the path is always close to the river, but is subject to flooding. On the northern bank the path detours away from the river at various places. 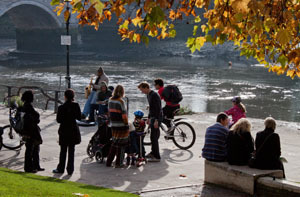 There is much of interest along the walk, including Syon House and Park, Richmond, Kew Gardens, Kew Bridge Steam Museum and the Musical Museum at Brentford. Even if you don't stop off at any of these, alongside the Thames itself there interesting structures, boats, buildings and wildlife. Refreshments: Plenty of choice at Richmond with more limited choices at Kew Bridge, Brentford and Isleworth. 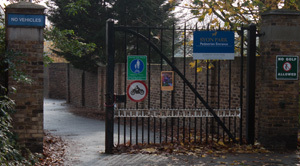 ... the pedestrian entrance to Syon Park. 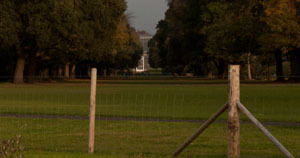 The road leads to the house and garden entrance. Unfortunately neither the garden or house were open on the day of my visit! Continue on the roadway leading past the house and out of the park. 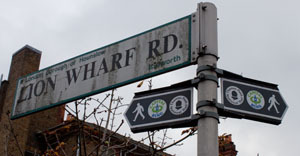 Turn left, following the Thames Path sign in the direction of Old Isleworth. This brings you to the river at the top of Church Steps (the site of a ferry which operated for at least 400 years). The road follows the river in front of All Saints Church, the away from the river between a pub (the London Apprentice) and terraced houses. Immediately after passing the "Welcome to Old Isleworth" sign you cross a bridge over the Duke of Northumberland's River. Turn left along the path towards the crane. 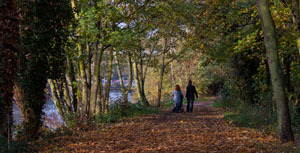 Walk down to the river and follow the path round to the right. The path leads in front of modern flats and across the patio of the Town Wharf. ... Lion Wharf Road. Where this road meets the main road, turn left. Follow Richmond Road until you see a "Welcome to Richmond..." sign. Turn left in front of the sign, along Railshead Road. The road leads past industrial units on the left, before joining the river bank. 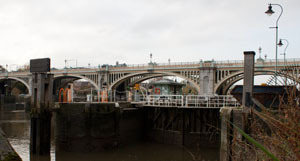 ... passing Richmond Lock, which provides the first option to cross the river and shorten the walk (though on the day of my walk, work was being carried out on the lock, which meant that you couldn't walk across and the water level in the river upstream was lower than usual). 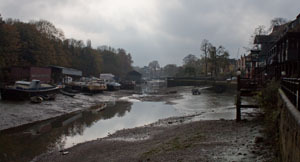 Walk under Twickenham Bridge (which provides a second shortcut), then under the railway bridge. At this point you are walking along Ducks Walk and there are houses between the path and the river. Ducks Walk runs into Willoughby Road, continue along this until it meets Richmond Road. Turn left and cross Richmond Bridge. There is plenty of interest in Richmond, including a small museum and gallery, housed in the library (formerly the Town Hall). You can view the exterior of the remains of Richmond Palace - and of course there are shops and plenty of places to eat and drink (I had even extra choice, as there was a farmers' market from which I bought food, and ate in the sunshine by the river, with entertainment provided by talented buskers). Follow the path back downstream. After passing under the two bridges the Old Deer Park is on your right. Look out for the three obelisks (which were used as meridian markers). ... so these photographs aren't really needed to confirm that you're on the correct path! The Deer Park gives way to Kew Gardens. 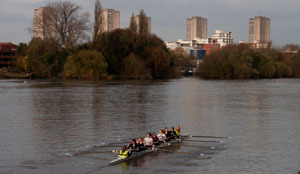 Walking gives you more time to enjoy the river than rowing! 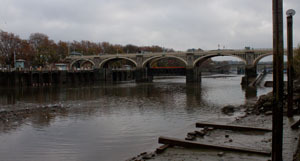 Re-cross the river at Kew Bridge, using the steps to climb up to the bridge, and down again on the opposite bank. 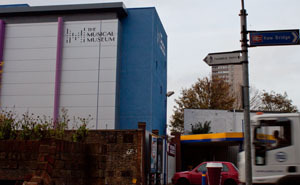 (if wishing to visit the very interesting Kew Bridge Steam Museum, continue to the road junction and turn left). Walk towards the river, passing a new development (under construction when I did the walk). 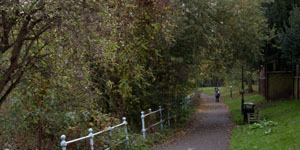 Continue along the path by the river, with house boats moored on the left. After a short distance the path turns away from the river, and emerges on Brentford High Street opposite the Musical Museum (I didn't have time to visit this - but, after viewing the website, I wish that I had). You are only on the pavement for a few yards before turning left, through a small park. At the Waterman's centre the signs give you a choice of rejoining the pavement or staying by the river for a (very) short distance. 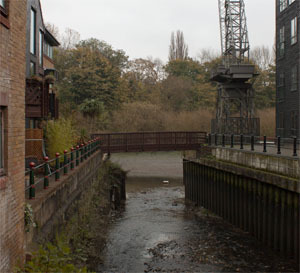 I chose to stay by the river, then had to descend steps by the Waterman's Centre, before returning to Brentford High Street (opposite McDonald's). Turn left and then left again at Goat Wharf. On reaching a pool used for mooring, walk past restaurants and flats, keeping the water on your left. Almost as soon as you reach the river, you have to turn right along the Grand Union Canal. 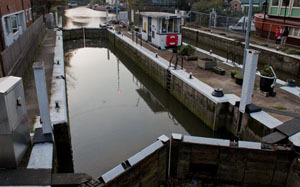 Walk a short distance along the canal, before the path turns right to take you around Brentford Dock. The path emerges on Dock Road. Turn right to cross bridge over dock and then over the lock. After crossing the lock turn sharp right down steps to canal towpath.